1. Place the sugar and water into a pan and simmer until the sugar has dissolved. Next, add the vinegar and syrup and bring to the boil. The mixture needs to reach 140oc - the hard crack stage - so check this with a sugar thermometer or drop a little of the hot toffee into cold water; if it turns hard, its ready, but if it's soft, boil the toffee some more. 2. Add a few drops of red food colouring and stir into the hot toffee if you want the authentic look! 3. 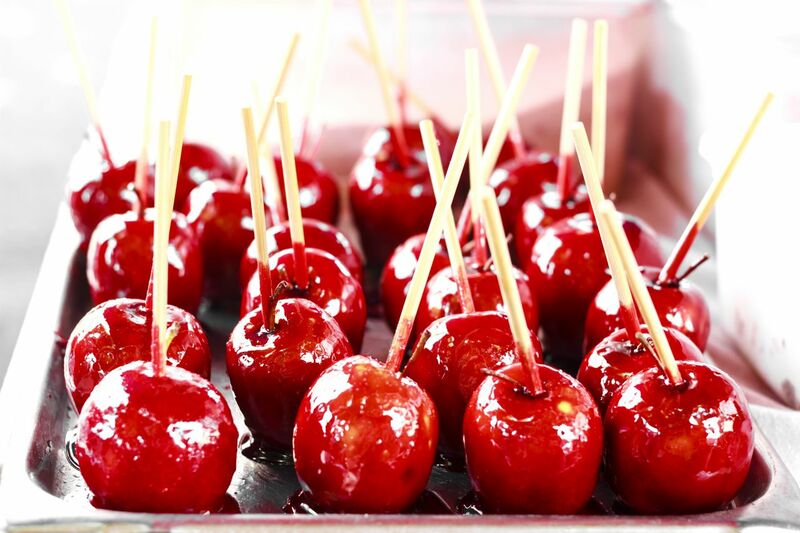 Spike the cleaned apples with lollipop sticks and dip them and twist to cover in hot toffee, then drain the excess. Place onto a greased baking sheet. 4. Why not try some different coatings? Roll in chopped nuts or broken biscuits or cereals for crispy toffee apples. Remember, the toffee is very hot, so please be careful when handling! 5. Leave apples to cool until set before serving. To clean the toffee pan, simply fill with water and bring to the simmer to dissolve any leftover toffee.